Sims Municipal Recycling workers in Sunset Park voted to approve their first union contract as members of Teamsters Local 210 today. The vote caps an organizing drive by workers at the recycling facility, which processes all of the city’s residential recycling. Under the contract, workers will receive immediate raises and a union healthcare plan with premiums fully paid by the company. Workers had been motivated to organize a union because of disrespect at work and expensive healthcare. Under the agreement, the company will cover all healthcare costs. Previously, workers had paid $0.61-$2.64 per hour in healthcare premiums. The new contract also guarantees annual raises, a retirement plan, increased vacation time, and a higher education program. Workers will be protected from discrimination based on race, ethnicity, country or origin, gender status, and union activity. They will have representation during disciplinary procedures and will be able to grieve violations of the contract. Sims workers endured a hard-fought campaign for a union at the facility, which processes all of the residential recycling collected by the New York City Department of Sanitation. Workers informed company management in December 2016 that a majority had signed union authorization cards with Teamsters Local 210, but the company refused to bargain a contract. Workers threatened a strike that would have shut down the city’s recycling system, and traveled to the City Council to speak out against workplace abuses. 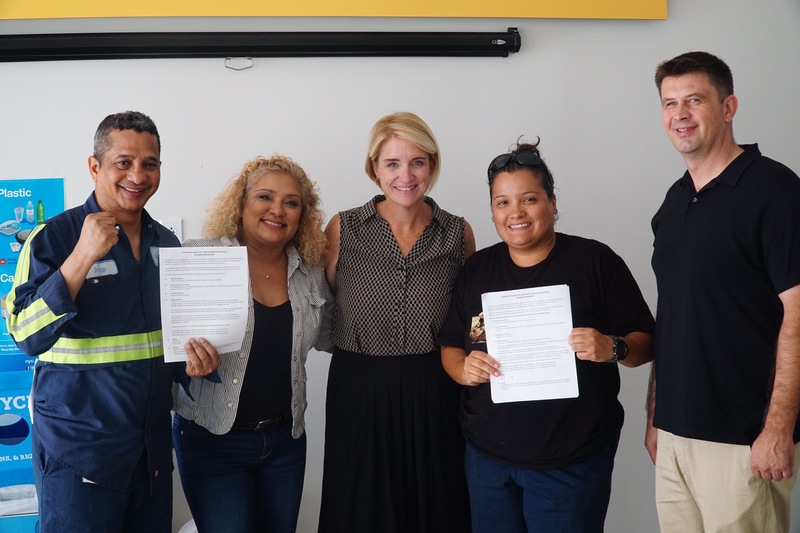 In March, Teamsters Local 210 and Sims reached an agreement for an expedited election, in which the company remained neutral and workers voted to join the union. The Teamsters and its many New York City locals represent thousands of sanitation workers at the New York City Department of Sanitation, private carting companies, and at waste and recycling facilities. The union and its allies in the Transform Don’t Trash NYC coalition are working to raise standards throughout New York’s sanitation industry, both for workers and the communities they operate in. “This is a big win not just for workers in the sanitation industry, but for our entire city. While the Trump administration actively endangers the lives of immigrants and people of color, we are setting a model here in New York City for how to empower immigrant workers and workers of color who protect our environment. We’re thrilled to be involved in this successful effort to bring together labor, community, and environmental justice organizations to fight climate change and advance economic fairness,” said Maritza Silva-Farrell, Executive Director of ALIGN, a founding member of the Transform Don’t Trash NYC campaign. “New York Lawyers for the Public Interest congratulates the Sims workers, who fought hard for their rights at work and won. The union contract at Sims shows that high labor standards are indeed possible in the waste industry, and that they benefit workers, companies and the city as a whole,” said Rachel Spector, Director of Environmental Justice at New York Lawyers for the Public Interest. “Economic justice and environmental protection must go hand in hand as New York City marches down the road as a leader in sustainability and equity. Today’s vote is a symbol of things heading in the right direction and we congratulate Teamsters Local 210 and the leadership at Sims Municipal Recycling on this occasion,” said Eric A. Goldstein, NYC Environment Director at the Natural Resources Defense Council.